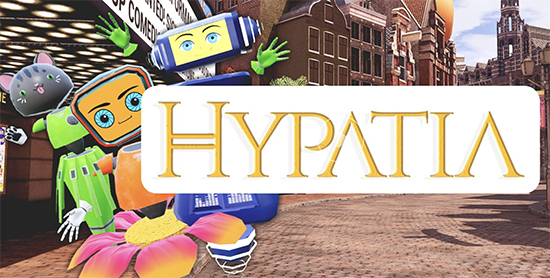 Get ready to live out your rockstar fantasy - playable musical instruments have arrived in the free-to-play social VR game, Hypatia! TimeFire VR adds a brand new way for the residents of its virtual city to use their imagination and hidden talents to shape the world around them. There are ten instruments - percussion, wind, and string - for you to choose from and play in today’s update, and no musical experience is necessary! Choose from drums, castanets, cymbals, acoustic guitars, electric guitars, ukulele, piccolos, pan flutes, and slide trombones! Try the new instruments out in the Theatre Du Nul or find them for purchase in stores throughout the city! Try them out by yourself, or jam out with a group of friends and gain bonus experience points! Each melodic instrument can play all 8 notes — tonic to tonic — of the G major scale, meaning you and your band will easily find a harmonious melody! Once you’ve found your groove, head to the Theatre Du Nul and sign up the Battle of the Bands event on October 20th at 3:00 PM EDT/12:00 PM PDT! You and a few friends can compete against other burgeoning musicians to be Hypatia’s next big musical sensation. The winner will walk away with some fantastic in-game prizes! So practice, practice, practice, because this is one event you don’t want to miss! Through extensive R&D, careful moderation and regular, continuous updates and improvements, TimefireVR has created an inclusive and inviting world where you can explore your creative side to its fullest potential. Players from around the world can sculpt, paint, curate photographs, perform on stage, and play with others in a multitude of online activities found throughout the globally-inspired environments of Hypatia. The artistic works of Hypatia’s citizens impact the evolution of the city itself - permanently! Hypatia supports seated, standing, and room-scale VR for the Oculus Rift and HTC Vive, as well as standard non-VR play. It is available now for Windows PC for free through Steam and the Oculus Store.